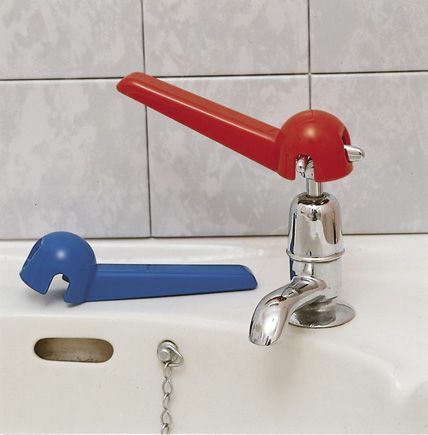 Tap Turners Strong Moulded Easy Use Tap Turers. These strong moulded tap turners simply hook over the top of a capstan of ”X” type tap, to make it easy to turn. They are supplied as a red and blue pair for hot and cold taps. Sold in pairs. Product exactly as described, easy to fit and use. Order processed promptly and arrived within 3 days. Very pleased. The tap turners fit very easily but are equally easy to slip off when in use. To prevent this I secured the handle with a tie-wrap. Simple Idea, Incredibly effective. Well made from durable material. In, short, delighted to have our arthritis-associated problem solved. Thank You.